Classic & Sportscar : "a superb account"
The Automobile : "packed with entertaining stories"
The Herald : "perhaps the definitive guide to the Rally"
Octane: "packed with pictures & anecdotes"
‘Many excellent books have been written about the Monte Carlo Rally but despite the fact that the first British winner started the rally from Caithness in 1926, the Scottish connection during the pre war years has been largely overlooked. This may be due to the lack of an overall winner from among the John O'Groats starters in subsequent years because of the complex scoring system which made it virtually impossible for them to achieve outright victory. However it was still a considerable feat to complete the non-stop journey from the north of Scotland to the south of France in the depth of winter. The cars were not the specialised racing machines of today - most were identical to the models which customers could buy from the showroom. 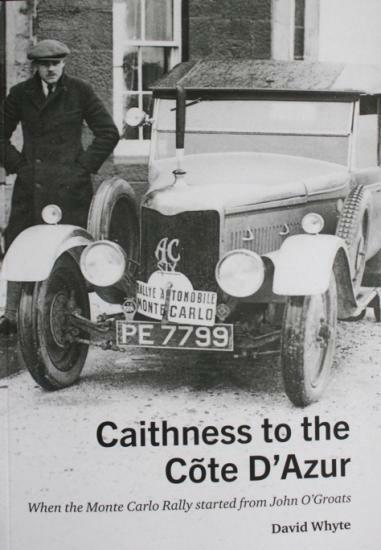 Caithness to the Côte D'Azur was inspired by the return of the Monte to Scotland in 2011. Victor Bruce was the first British driver to win the event when he started from John O'Groats in 1926 and more than 200 men and women followed in his wheeltracks over the next 13 years. Although outright victory was virtually impossible, other events such as the hillclimb and Concours de Confort were strongly contested by the British contingent but their stories are often overlooked in histories of the event. This book covers the cars, from M.G.and Riley to Rolls Royce and Bugatti as well as the drivers, from Le Mans winners to aristocrats. Weather conditions were often atrocious and it could be a challenge even to reach John O’Groats for the start. Considerable organisation was required for the event to take place and the vital role of the Royal Scottish Automobile Club is described. The story is brought up to date with a chapter on the 2016 event which saw cars return to the John O’Groats start for the first time since 1939, including an original Lagonda which had competed in the 1936 rally and an AC driven by the grandson of Victor Bruce.